Supporting women and feminist expressions. Thrive was a co-curated exhibition at The Beehive, in Boston, MA from September 13 — October 18, 2017 in celebration of the restaurant's 10th anniversary. The eighteen paintings, photographs, and sculptures in Thrive championed feminist expressions in their subject matter and represented artists who are fiercely committed to non-traditional, collaborative artistic practices. The eight artists in this all-female exhibition were chosen for the mastery of their craft, their stunning aesthetic, and their convictions. The works in this exhibition explore the power of female resilience and creativity—whether they are supporting incarcerated women, drawing attention to our impact on the environment, or lifting up the voices of underrepresented women. The exhibition artists support the production of knowledge that refuses to be reproduced in the dominant white cultural structure. Their work promotes social change and a world in which we can all thrive. Thrive artist included Ann Lewis, Rania Matar, Maria Molteni, Chanel Thervil, Silvia López Chavez, Elisa H. Hamilton, Evelyn Rydz, and the Safarani Sisters (Farzaneh and Bahareh Safarani). Thrive was co-curated by Jennifer Epstein and Kate Gilbert, founder and director of Now + There, and is part of Now + There’s Year of the Woman programming. The exhibition takes its name from one of the works in the exhibition, a word hidden in Ann Lewis’ collage “Objects of a Dehumanized World”. Cover image: detail of "Shannon, Boston Massachusetts, 2010" by Rania Matar; courtesy of Carroll and Sons. On March 6, 2017 at District Hall in Boston's Seaport, with artist Paul Ramirez Jonas and the artist ambassadors, participants, and volunteers of Public Trust, we reflected on the 956 promises spoken, drawn in a contract, displayed on a billboard and now collected in print as the Public Trust book. Audiences viewed the moving Public Trust documentary from RAVA Films. Paul Ramirez Jonas and panel of participants and artist ambassadors including Jimena Bermejo Black, Furen Dai, Maria Finkelmeier, Silvi Naci, Chanel Thervil, and Graham Yeager spoke with moderator Dan Byers, Mannion Family Senior Curator at the ICA, about their experiences making and facilitating promises during the 21-day run of Public Trust. Watching Public Trust, the documentary. Together, we looked critically at the promises made and their journey from hearts, to drawings, to a billboard and, now, to print. Among the evening’s highlights were surprises like that of participant Marcia, when she learned that the artist ambassadors facilitating each promise were scripted. Public Trust is published by APC in collaboration with Now + There with support from the Elizabeth Graham Firestone Foundation and distributed by D.A.P. Visit the Now + There store to purchase a copy. Joe, who promised to forgive his flaws, met Furen, who took his promise in Kendall. Joe told us, "I don't know anything about art, but I enjoyed myself." On April 11, 2016, with Massachusetts College of Art and Design N+T co-hosted the Boston debut of FIELDWORKS: Season One, A Blade of Grass’ film series. 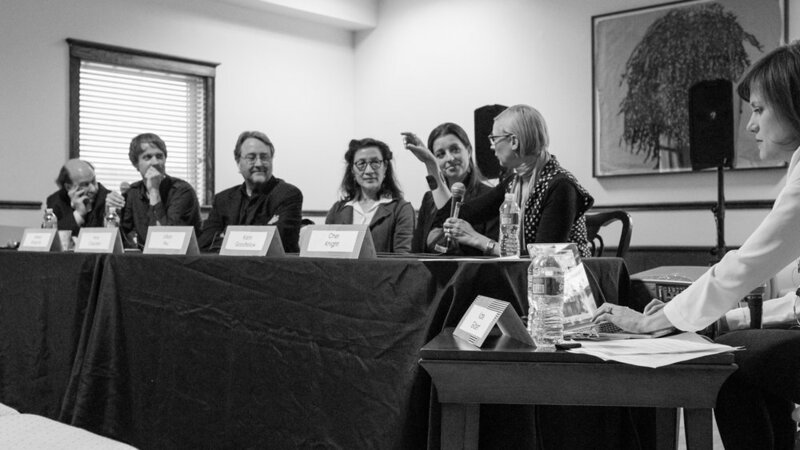 Through film we explored the impact of socially engaged artists Mel Chin, Brett Cook, Pablo Helguera, Fran Ilich, Jan Mun, SexEd: Norene Leddy & Liz Slagus, and Jody Wood. Following the screening we discussed the medium of film to disseminate ideas, ABOG's fellowship program, and the impact of public art with Deborah Fisher, Founding Executive Director of A Blade of Grass (ABOG). FIELDWORKS: Season One films can be viewed for free on ABOG's website. For more in-depth information on the featured artists and their community participants and collaborators, check out ABOG's forum. FIELDWORKS Season One is produced by RAVA Films and One Hundred Seconds with A Blade of Grass, a New York City based organization nurturing socially engaged art. On October 28, 2015, Now and There co-hosted a talk by Paul Ramirez Jonas with Massachusetts College of Art and Design. Over the past 25 years, Paul Ramirez Jonas has sought to challenge the definitions of art and the public and to engineer active audience participation and exchange. To engage completely with his projects, he often asks participants to contribute something: spare change, a wish, their own version of history. This reciprocity is a manifestation of trust and a social contract through which the viewer and artist create meaning. His works have included large-scale monuments with cork boards for impromptu messages and performative pieces in which he mailed keys to the nearest 5,000 residents of Cambridge’s Taylor Park to explore notions of access, trust, and belonging. Read more about Jonas on our blog, visit his website and watch his presentation. Learning From Our Communities (September 10, 2015) was a simple community engagement project initiated at the Emerge festival at City Hall. We asked the public a variety of questions regarding their thoughts and opinions on what their neighborhoods need as well as the gems and resources they cherish. Read the blog for more answers to this and other questions. Play in Public Art (July 19, 2015) was a lively outdoors panel with co-sponsors BSA Space and the D Street ArtLab and the artists, architects, and citizens who are making public art happen in Boston. We explored the role of play in three current public art topics – spectacle, site, and architecture – in a fast-paced, round-robin discussion followed by Q&A. Panelists included Ian Deleón (interdisciplinary artist), Chris Frost (educator and exhibiting ArtLAB artist), Kate Gilbert (D Street ArtLAB curator and Now and There director), Kelly Goff (educator and exhibiting ArtLAB artist), Mary Hale (educator and architect at Shepley Bulfinch), Robert Lobe (exhibiting ArtLAB artist), Amanda Parer (exhibiting ArtLAB artist), Alice Vogler (artist, curator for Time, Body, Space, Objects, part of the Isles Arts Initiative) and Arts Program Manager at Boston Children’s Museum. Moderated by Chris Wangro, Lawn on D Impressario and Artistic Director. Read our wrap-up complete with panelist quotes on the blog.